Instagram, like Twitter, is all about fostering a kinder, safer community. That means new tools or tweaks to the photo sharing service that will allow for better protection for your account and also the eyes of those not wanting to see something offensive. In the near future (“soon”), Instagram will start to blur content marked as sensitive. Why would it be blurred in the first place? Because someone flagged it as being sensitive and person from Instagram confirmed that it may not be suitable for everyone. This doesn’t mean it violates any Instagram terms, it just means that not everyone will appreciate the substance. To access it, you’ll simply need to tap on it. 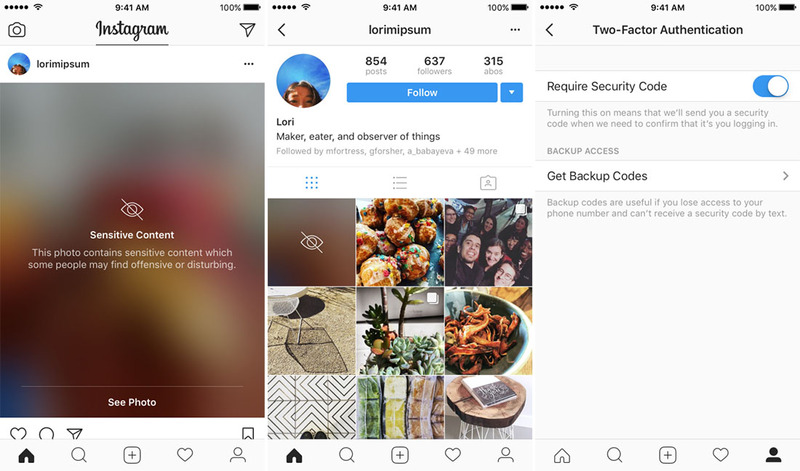 As for account protection, Instagram has now fully rolled out 2-factor authentication. You should use this if you aren’t already. With 2-factor authentication, Instagram will require a code every time you login that is sent to you via SMS. It’s an extra layer of security that makes it much more difficult for someone to access your accounts. You can find the setting for it in your profile settings.